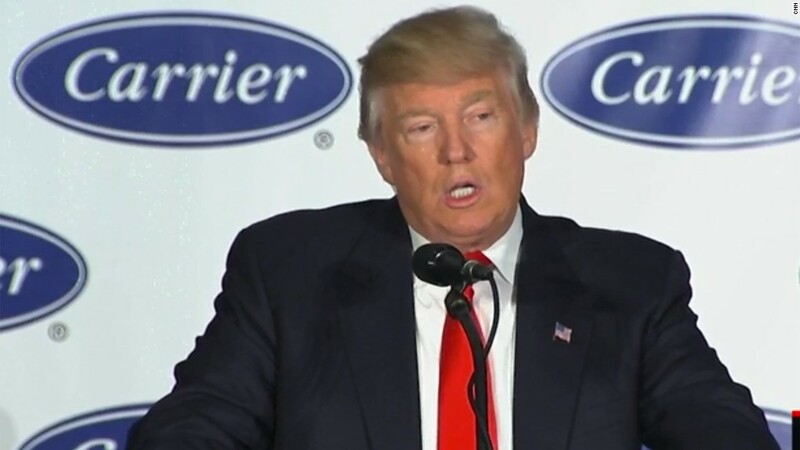 President-elect Donald Trump said Carrier is "keeping 1,100 people" in jobs that won't be shifted to Mexico from a factory in Indianapolis. The real number is 800. To get the higher number, Carrier and Trump are counting 300 jobs that weren't at risk of being shipped to Mexico. Carrier confirmed to CNNMoney on Friday that it never planned to move 300 administrative and engineering positions. Those jobs are at a different Indianapolis location, separate from the plant with the 1,400 factory worker jobs that has been in the headlines recently. Under the deal with Trump, Carrier agreed to keep the furnace part of the plant open, saving 800 jobs in Indianapolis. But it's still moving 600 jobs to Mexico to make fan coils. The company laid out the moves in a letter to employees Thursday, saying it expects the move will be completed by the end of 2017. Carrier also confirmed Friday that a second factory owned by Carrier corporate parent United Technologies (UTX) is also still moving to Mexico. That move will cost Indiana another 700 jobs. The Trump transition team did not respond to a request for comment about the jobs moving to Mexico. Related: Trump says he'll punish companies for leaving U.S. In its letter to employees, Carrier said that laid-off workers will have the chance to transfer to open jobs at other United Technologies plants around the country. They'll also receive up to four years of tuition assistance to go back to school and train for another job. It's also possible that the company will offer some Indianapolis factory workers a buyout. Chuck Jones, president of the local unit of the United Steelworkers union which represents Carrier workers, said that he hopes the company will offer workers the chance to leave voluntarily with the severance package that was previously negotiated -- one week of pay for every year of service. Ideally, more senior workers at the plant would take the package and retire and save the jobs of younger workers. The plant has a large number of senior employees.